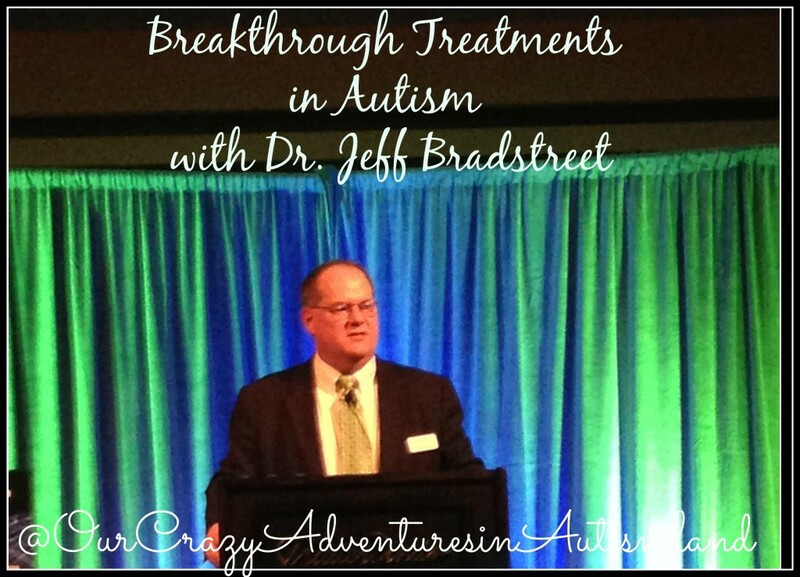 Breakthrough treatments in autism with Dr. Jeff Bradstreet came on Day 2 of the National Autism Conference 2014. As per his usual, the session was cutting edge with new treatments. Sessions like these are when you really need someone taking notes alongside you so as to not miss anything. There were several things that I didn’t understand that I’m sure Michael could have explained later to me. Even recovered kids need support. Their supplement and nutrition goals will change. They will remain susceptible to increased inflammation. Food is a critical part of everyone’s life. You have to improve the diet to get all the other things to work. Bravo probiotic is what he recommends to help heal the gut . He has a blog post on exactly what to do to use it effectively. Extra fluid around the brain that doesn’t resolve by age 3 can be a diagnostic predictor for autism. Bradstreet thinks this is due in part to inflammation on the brain. Pandas – studies show IVIG reduces inflammation bringing relief from the symptoms. Scott Smith said the same thing in his talk about this subject. Get an inflammation plan in place with your MAPS doctor. You have to treat inflammation. When you don’t rest at night you alter the thermonuclear (the ability to regulate temperature) of the brain. It’s like trying to watch 3 tvs at one time. EVERY CHILD IS DIFFERENT! One plan that works for one child may or may not work for another child. Each child needs an individualized plan based on his own chemistry and needs. Don’t be afraid to do something different to help your child. Bradstreet was our doctor for Logan when we first started biomedical interventions. He was always friendly and approachable. He would often forget that not everyone had a medical brain like his so he would use unfamiliar words that could lose a person. It is with great sadness that I tell you of his passing . He was a great warrior for the autism community . He will be greatly missed. Want more autism tips? Check out my Pinterest board! Great post! It’s amazing that cannabis oils can reduce brain inflammation, there are certainly many great benefits that come from the cannabis plant. Thanks for sharing! Didn´t know that cannabis oils can reduce brain inflammation. I happy that science is working in this cannabis properties. Thank you for sharing all of this. I like how you mentioned that every child and case is different and there is no one size fits all. The research and usage of cannabis oil is very intriguing though. Yes! The phrase is if you met one child with autism then you’ve met one child with autism. They are all different.